I've written openID login for google App engine. 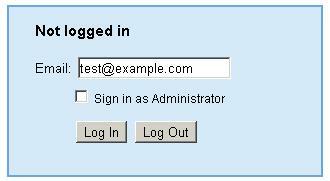 question 1) How to create openID login at localhost too. This is a normal behaviour, because on localhost you might want to try many different accounts and it would be a mess if you had to actually login every time with a real one. So when on localhost you can just simulate an OpenID user just by providing any email you want and checking if you want to be an admin or not. Not the answer you're looking for? Browse other questions tagged google-app-engine openid google-openid or ask your own question. What if some users do not need to be users? What is the difference between Google App Engine and Google Compute Engine?